On February 6, 2015, SGS successfully conducted a seminar on LNG Awareness in Karachi, Pakistan. May 1, 2015 - PRLog -- With themes ranging from achieving excellence and reducing complexity to getting answers from field to fuel, SGS’s inaugural liquefied natural gas (LNG) industry (http://www.sgs.com/en/Oil-Gas/Downstream/Logistics/LNG-and-Gases.aspx) awareness session, hosted at the Pearl Continental Hotel in Karachi, Pakistan, on February 6, 2015, proved to be a huge success. 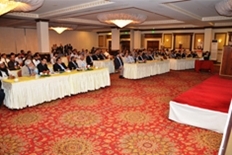 The awareness session, ‘LNG - Achieving Excellence from Design through Operations’, jointly hosted by SGS Pakistan’s Industrial Services (http://www.sgs.com/en/Industrial-Manufacturing.aspx) and Oil, Gas & Chemicals Services, was attended by more than 100 local stakeholders and clients with the aim to explore the inspection requirements for both LNG storage terminals and distribution networks. The seminar incorporated the themes of ‘Getting Answers from Field to Fuel’ and ‘Reducing Complexity to Manage Your Processes’ and was presented by Muhammed Aqeel, Manager Operations, SGS Pakistan and SGS’s Global LNG Manager, Sven Lataire. The objective of the seminar was to enhance stakeholder’s knowledge of the LNG industry at stages ranging from design to procurement, from construction to commissioning and product receipt to delivery operations. SGS’s Global LNG Manager, Sven Lataire had a special focus on LNG sales and purchase agreements, measurement criteria, quality testing and certifications, selecting gauging devices, determination composition LNG (+ Vapor), calculation section and measurement procedures followed by a visual tour. Farrukh Mazhar, Managing Director SGS Pakistan gave the opening remarks, followed by Abdur Razzak Lakhani, Director Operations Industrial Services and Shahnawaz Ullah Khan Director Operations Oil, Gas & Chemicals Services, who discussed the topic and gave the session’s brief respectively. SGS is the world’s leading inspection, verification, testing and certification company. SGS is recognized as the global benchmark for quality and integrity. With more than 80,000 employees, SGS operates a network of over 1,650 offices and laboratories around the world.